Rachel and Greg said their "I do's" in front of their families and friends on August 26th, 2017 at the Music Box Supper Club in Cleveland, Ohio. Rachel started out the day by getting ready with her bridesmaids in a backroom at the Music Box Supper Club in Cleveland, Ohio. Greg arrived at the Music Box Supper Club shortly there after. Rachel and Greg had decorated the venue beautifully and had several unique touches as part of their decorations, such as photos of dogs with numbers for table markers. Rachel and Greg had organized a first look to take place on the roof of the Music Box Supper Club. After the first look, they did their all their portraits. Their family photos took place inside the Music Box Supper Club. Their bridal party photos took place outside the Music Box Supper Club in the Flats on the River. We were even honked at by boats passing by. They continued their photos by going to Shooter's on the Water, where they took a few more bridal party photos and all of their soon-to-be wed bride and groom portraits. After the photos were concluded, the bridal party "pregamed" in the backroom until the ceremony started. The ceremony took place in the main dining area of the Music Box Supper Club. After the ceremony, the couple had an hour long cocktail hour, where they hung out and greeted their guests. It was a fun night. 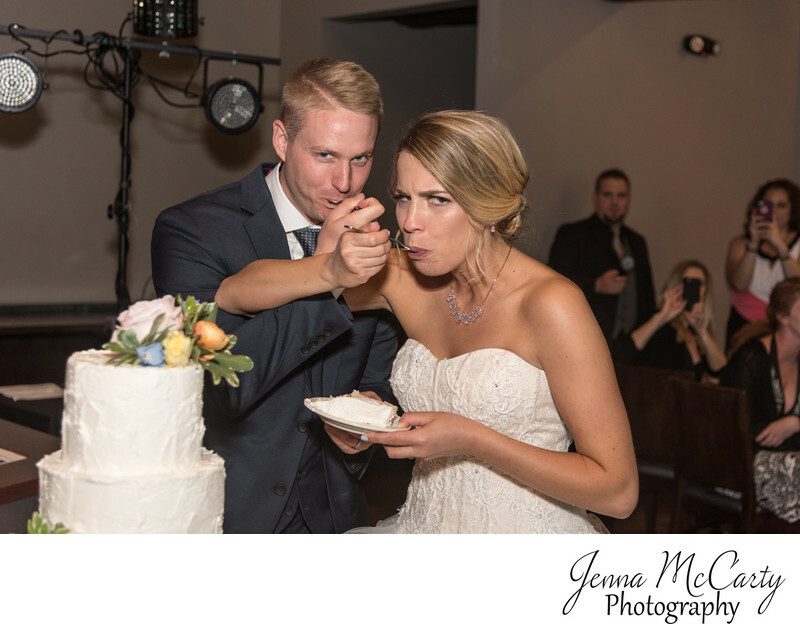 This photo features the bride and groom eating cake after cutting the cake in the Music Box Supper Club in Cleveland, Ohio.